Last chapter I listed some (and only some) of the suggestions people showered at me. Ways to fight cancer. Ways to improve my health. I became so overwhelmed by all the free advice and not-so-free treatment suggestions I didn’t know where to start. Then, at my next visit to Dr. Meiring, I discovered he had his own ideas. Actually, they weren’t just ideas. He expected me to follow his recommendations. In view of all the information and misinformation floating around my head I was only too relieved to have someone with authority dictating what I should do. Later, a good friend from Durban, a distance away, wrote and sent me two jars of an expensive dark green powder called Barley Green. She explained how this powder, which she sold, would help my immune system cope with the treatment I was about to embark on. Included in the package was the name and phone number of the representative in my area. The jars sat unopened for a number of days. It looked so revolting! Eventually I felt guilty. My friend had paid out a lot of money for me. I reluctantly started taking it, following the instructions. It tasted every bit as repulsive as it looked. I determined to just take it long enough to prove it didn’t help. I started to mixing it with some strong fruit juice and found as long as I gulped it down without stopping to taste or smell it, I could tolerate the ghastly drink. What we do to honor our friendships! It was with relief that I came to the end of the jars, and decided I didn’t need to take any more as my friend wouldn’t know. A few days later, I reached for the telephone to order more. I realized it had really helped to build up my energy, and I needed to take it for the rest of my treatment. Praise the Lord for generous friends. The result of all this advice was that I stopped reading about diet and nutrition. Each time a book started to tell me what I should or should not be eating, I turned pages until I reached another section. It was only much later that I would realize I was ignoring a major part of the healing process, and giving my poor overworked immune system even more tasks to cope with. “Take up yoga,” came more advice. There just didn’t seem to be an end to the things I could or should be doing to rid my body of this cancer, even where it went against my beliefs as a Christian.. Eventually I found myself suspicious of so many things. Is it safe to use this deodorant? How wise is it to use perfume? If we went in the car on the freeway, I would put the window down. The air conditioner was bad for me. “Oops,” I closed them again to avoid the car fumes and smell of petrol. I’d switch on the air conditioner. Well meaning though all the advice no doubt was, I found the total confusion and misinformation I received from people, including an unsure medical world, made things so much worse. Perhaps the cruelest advice I received, at intervals throughout that terrible year, was the best intended. I am a committed Christian, so why do I say this was cruel? It implied to my over-sensitive mind that people thought I wasn’t trusting Him. It made me feel that perhaps, if I really had faith, I would not subject my body to all this treatment. Is my faith at fault? I often wondered. During my treatment period, two other people in our congregation, both Christians, did this very thing. They declared that God had healed them and stopped their treatment against medical advice. I played the organ at both funerals. I stared at her wide concerned eyes. One day when I was reading my Bible, I came to the well-known twenty-third Psalm. Next time someone asked me about why I didn’t stop treatment and trust the Lord, I opened to that passage. “In the valley of the shadow of death?” she read the words slowly, doubt creeping into her voice. I hoped I appeared more confident than I felt, yet I knew that what I said was true. I had to keep my eyes open, looking out for the rod and staff He had promised to leave for me in the valley. When I started to feel afraid, I often went to my brown paper wall hanging of cards, and read the beautiful words and encouraging messages. One which really encouraged me was a computer message by an unknown author, beautifully printed and posted to me by my daughter’s mother-in-law. I remembered those weak, confused cells my doctor had described to me. They were indeed so limited. Yes, the war against cancer was beginning to hot up, but I had a wonderful family, many dear friends, and a countless army of prayer warriors throughout, not only South Africa, but overseas as well. Most important, I had the Lord on my side. The enemy might appear threatening, but “Greater is he that is in (me) than he that is in the world.”2 I drew a deep breath, and prepared to move into the unknown. Would you like a gift for a friend or loved one? What saying or quote helps you when you look at the topic of cancer? Please share below. One day there was a ring at the doorbell. “We have come to pray for Rob,” announced one of our church elders. How good that some folk had started to realize that it may be worse for the partner or care-giver. The center of attention is usually the patient. I stared at him in surprise. “Funny. My reaction is the same. I am glad that if one of us had to have cancer, it is me. I don’t know how I would handle it being you.” Again, the Lord had made us a team. A team well equipped to fight cancer. What about the children? No-one ever thought to minister to my two sons, or to my daughter overseas. Sadly, nor did we. I am sure there were many times during those dark days when they needed to be able to talk and share their deepest fears. They were young adults, but we were a close family, and their mother had cancer. The two boys were there for us both, but who was there for them? Debbie, so far away, really grappled with the whole situation, unable to be a part of our support system, and with no real friends in a new, foreign country. I have since spoken to mothers of young children, and heard the same sentiments expressed. “My children needed support too. Oh people were very good in taking care of them physically when it was needed, but they needed counselling. They needed to know what was happening to me. There is a fabulous book written by Leticia Croft-Holguin that portrays the cancer journey in a way little ones will understand. “Cancer Starts with Cancer Starts with C” is a beautiful book in every sense. It is written for the younger child, although I admit I enjoyed it myself!C” is a beautiful book in every sense. It is written for the younger child, although I admit I enjoyed it myself! “The beautiful illustrations turn what could be a scary story into bedtime reading. It is a book that every child will love. “I knew people got cancer, I just didn’t think it would ever happen to me.” This was another comment I often heard. I understood what they were saying. Shirleys don’t die! “People don’t know how to speak to me,” was another common complaint. I have to say that this was rarely my experience. Our friends were very supportive, and, as long as I looked well, they treated me like normal. The days when I looked really bad however, they often didn’t know what to say. Nor did they want me to talk about cancer all the time. Who can blame them? Yet I needed to talk about it. I longed to share what I was feeling and hear how others were coping. I longed for someone to compare notes with, but that was one thing my oncologist was adamant about. He didn’t believe in support groups. “Please don’t talk negatively,” Rob often said to me if I mentioned dying. But I wanted to talk about what I was going through, and that included the possibility of dying. Was I ready to die? I knew I wasn’t. The thought of death scared me, and yet from a spiritual point of view I felt I should be. I was a committed Christian in full-time ministry. Rob, who was so supportive in every other way, became really distressed when I brought up the subject, and so I stopped talking about it—for a while. It was difficult to sort out truth from fiction. “Only drink ionized water. That is very important if you want to fight cancer.” What is ionized water anyway? “Stay out of the sun.” I don’t have skin cancer! / “Get plenty fresh air.” How do I get fresh air without going into the sun? I live in Africa. “Take massive doses of Vitamin C every day.” And they did mean massive! “This company knows how to cure cancer.” Right – so why doesn’t the world know this? Who could afford all that? In any case, I didn’t want to live on a diet of pills. Then my oncologist stepped into the discussion. Looking at Statistics about Cancer? Why did I get cancer? The question rumbled round and round in my mind. nor was I really overweight. I now found myself desperate to know more. I started to consume every book I could find on the subject: the Cancer Association articles, the books about breast cancer from Beulah, some which Rob found for me in the library and others brought to me by visitors. As soon as I was strong enough, Rob took me to the local bookshop and to the nearest Christian bookstore. I sensed that there was more to this disease than the physical. Surely there were things I could do on an emotional level, which would not offend my Christian faith. Almost all the books about breast cancer I read encouraged practices which I knew to be wrong, allowing outside forces to take over my mind and body. They encouraged me to make my mind a blank, to go into a trance, to allow myself to be hypnotized. I didn’t believe I should allow any of these practices. Yet I knew I should be able to involve my mind in the healing process. 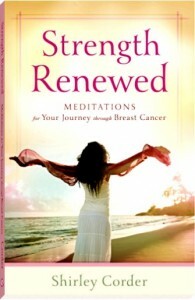 We continued to hunt for Christian books about breast cancer, especially real-life stories. I soon learned the importance—for me anyway—of checking the back page before bringing the book home. If the last page contained an obituary I put the book right back on the shelf. I needed to be positive. There were people out there who had survived, and those were the people whose books I needed to read. So few books met my requirements. I resolved that when I was well again, I would write the book that I needed right then. Meantime I had to find ways to use my mind and emotions. But how? I put this to one side temporarily, and returned to more pressing issues. What had caused my cancer? I already knew that cancer was caused by the reproduction of deformed cells. It encouraged me to think of them as weak and confused. This was the opposite to the usual picture of cancer as the “Almighty Destroyer.” But what had caused these cells to become deformed in the first place? Why had I developed cancer? I learned that Breast Cancer is one of the few cancers which can occur in families. I was the first one in my family, and I prayed that I would be the last. My siblings were at high risk. Seeing I only had one brother and no sisters, I thought we were in the clear. I discovered that what is generally thought of as a women’s problem is actually on the increase in men. An American survey states that for every 100 women, one man is diagnosed with breast cancer. A man in America tried to enter a promotional race for survivors of Breast Cancer, but was turned away, as it was only for women. He contested this, but I can’t remember if he won his case. I hope he did. As far as I knew, none of my ancestors had suffered from breast cancer. But my children all have to be diligent in checking their breasts regularly, my sons as well as my daughter, and my grandchildren as they grow up. Once cancer cells start to multiply, they do so at an alarming rate. Some of them, if not arrested in time, spread to adjacent tissue, or they may even travel via the blood-stream or lymph vessels to distant organs. There they set up camp and form a secondary tumor,known as metastases. However the incredible speed with which they reproduce is also part of their downfall. Radiotherapy and chemotherapy both rely upon this accelerated growth for their effectiveness. In each of these treatments, the machines or chemicals target rapidly growing cells. So the fast proliferation of the cancer cells actually blows their cover. I hadn’t realized, until then, that there are different types of breast cancer, as well as several stages. My tumor was Stage Two and had already started to spread from the breast. The oncologist explained that it was very fast growing, and the pathology report described it as “poorly defined.” This meant it was difficult to remove. The statistics also said that three out of every four “Stage Two” breast cancer patients will live to be grandparents! That fact is not widely publicized. I deliberately started to cultivate a scornful disregard for statistics. After all, there are no statistics for how long Shirleys live after contracting cancer. I am not a statistic. There is only one me. Some years ago, if I survived five years after my operation, doctors would regard me as being cured. Medical experts today know this is false. Today, if there is no sign of a recurrence, medical experts will say it is “in remission.” The breast cancer cell can regenerate, so it can always come back. Having said that, every day that passed after the surgery my chances of survival increased. I didn’t want to know how long medical science thought I had to live. How could a mere doctor tell me that? In the Bible I read All the days ordained for me were written in your book before one of them came to be (Psalm 139 verse 16). God knew how long my life would be before I was even born. My diagnosis hadn’t blown His plans! I certainly didn’t want to live according to a man-made measure, watching as my earthly time got shorter each day. What would I do if I ran out of days? How do you think you would react if you were told by medical professionals that you had 7 months to live? What would you do with that information? How would it affect your decision-making? These events occurred over 20 years ago. I have tried to recreate events and locations as accurately as possible, but in order to maintain their anonymity, in some instances I have changed the names and identifying characteristics of individuals and places. Toward the end of our session together, Dr. Meiring took me through to his examination room, and for the first time examined my breasts. He prodded and poked with big warm hands on my extremely tender breasts. I think he probably tried to be gentle, but my right breast was extremely painful. The scarred tissue at the site of the tumor bed was still raw and my breast felt bruised. Each time he probed with his fingers I wanted to cry out. Then came the moment I was dreading. He asked me to put my left arm over my head. Dr. Meiring stepped back from the bed with an expression of annoyance on his face. Before chemotherapy commenced, I had to deal with radiotherapy. And I had to get my arm up over my head. I saw why the physiotherapist hated me having my arm in a sling. “One step at a time! I can do this,” I chanted to myself aswhen I got dressed. Rob phoned a friend, Flip, who worked in central Johannesburg, and asked him if he would please go via Dr. Meiring’s rooms and pick up the tablets, so he could take me straight back to our house. I battled tears all the way home. I had failed. Now I would probably die because I couldn’t start treatment yet. I had let Dr. Meiring down before we’d even started. I knew I could do no more. I felt discouraged and incompetent. “I’m never going to be able to do this in one week,” I moaned tearfully at Rob, returning to my position in front of the wooden door. That evening Flip arrived with his wife Karen and brought the tablets for me. There were other visitors there too, and a buzz of conversation filled the lounge. My eyebrows shot up in astonishment. I hadn’t been following his conversation. “Oh? Who was this?” I had never known Flip to gush about anyone before. So everyone was sure. Except me. I felt as if I was facing World War III with only a sling shot in my hands. I remembered a joke I had just read in Sue Buchanan’s book, Love, Laughter & a High Disregard for Statistics. There was a lawyer standing in the queue outside the gates of heaven. He noticed a certain doctor walking right past everyone, nodding at Saint Peter as he entered heaven. The lawyer felt this was wrong, so he complained to Saint Peter. A week later we phoned to confirm the time of appointment for my first radiotherapy session at the Oncology Unit of the Rand Clinic in central Johannesburg. I could get my arm over my head . . . just. The war was about to begin in earnest.